Hello guys, I apologize for not being up to date with posting recipes. I know it’s been almost a week since my last post. With Thanksgiving, my husband’s relatives visiting, and my kiddos’ crazy schedule (they’re up most of the night and went to bed very late messing up my sleeping schedule as well), I was exhausted and didn’t want to do anything but get some sleep whenever I could. Anyway, I hope you tried the white bread recipe I posted earlier and liked it 🙂 . So I’m back to cooking, photographing, writing down, and uploading recipe in my blog. I have mixed feelings actually because I didn’t like cooking and taking photos with my kitchen light on. I just hate that “yellowish” tint in the photos. I like it better taking pictures using natural daylight because the food looks so much better. But since day times are shorter around this time of the year where I live (it gets dark around 5PM here in Northern California) and I don’t have fancy lighting equipment for food photography, I have to settle for it. Unless I’m cooking around noon which isn’t always possible. But I’ll still do my best to present my recipes in a consistent manner with step-by-step instructions and pictures even if on some occasions I have to cook in the evening. For today’s recipe, I am sharing how I make ginisang sitaw. This is one of the easiest Filipino meat and vegetable dish out there. It’s usually prepared for lunch or dinner and served with boiled white rice. The term “ginisa” simply means “sauteed”, while “sitaw” is the Tagalog word for long beans. This is a versatile dish as you can skip the meat or substitute with chicken, beef, shrimp, or even flaked fish. To make it vegetarian, use tofu instead of meat and substitute pork bouillon cube with vegetable bouillon. 1. Slice pork belly into small trips about ¼ inch thick. 2. Peel carrots and cut into diagonal strips, or julienned, whichever you prefer. 3. Wash and remove seeds from bell pepper, then cut into strips or julienned as well. 4. Wash long beans, trim the ends, and cut into 2-inch lengths. 5. Peel and mince garlic. Also, peel and slice onion. 6. Heat skillet on medium high. If using pork belly, add meat slices into the skillet and allow most of the fat to come out and for the meat to brown, about 3-5 minutes. If using lean pork, add oil and sauté until meat is browned, around 3 minutes. 7. Add onions and garlic and sauté until onions get translucent and garlic has browned a little, about a minute. 8. Throw in all the vegetables and the bouillon cube and sauté for about 3 minutes, enough for the pork cube to dissolve. 9. Pour in the soy sauce and mix. Cover skillet and cook for additional 5 minutes until vegetables are tender, stirring once. 10. Add ground black pepper last. 11. Serve immediately with rice or as it is. 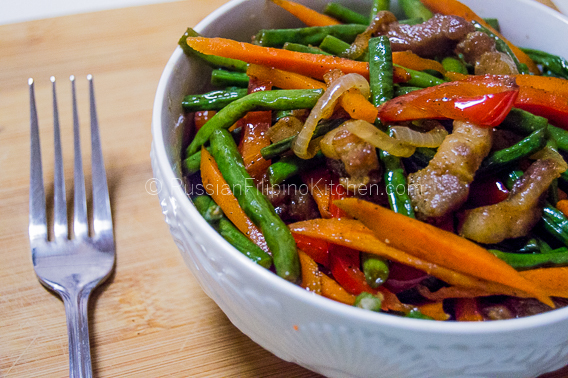 An easy meat and veggies saute that goes great with rice. Slice pork belly into small trips about ¼ inch thick. Peel carrots and cut into diagonal strips, or julienned, whichever you prefer. Wash and remove seeds from bell pepper, then cut into strips or julienned as well. Wash long beans, trim the ends, and cut into 2-inch lengths. Peel and mince garlic. Also, peel and slice onion. Heat skillet on medium high. If using pork belly, add meat slices into the skillet and allow most of the fat to come out and for the meat to brown, about 3-5 minutes. If using lean pork, add oil and sauté until meat is browned, around 3 minutes. Add onions and garlic and sauté until onions get translucent and garlic has browned a little, about a minute. Throw in all the vegetables and the bouillon cube and sauté for about 3 minutes, enough for the pork cube to dissolve. Pour in the soy sauce and mix. Cover skillet and cook for additional 5 minutes until vegetables are tender, stirring once. Add ground black pepper last. Serve immediately with rice, or as it is. What do long beans taste like? I’ve seen them at Sea Food City. Are they similar to green beans in flavor and texture? Personally, I find both taste similar. Texture-wise, long beans is a little chewy than green beans.